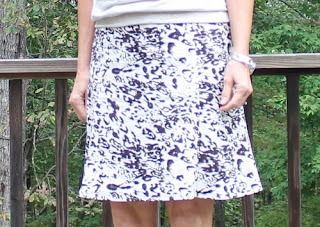 My most favorite skirt pattern! Hmmm, seems each new skirt is my 'most favorite'. I think I got my fit right this time. 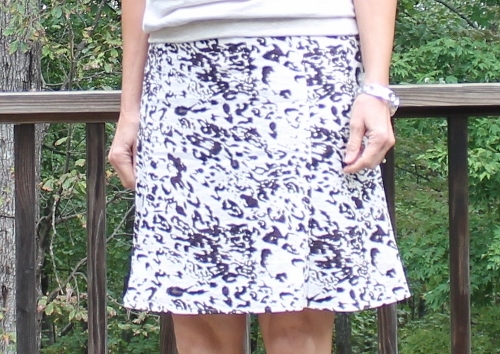 This 7 piece unlined A-line skirt from BurdaStyle Sewing Handbook 'Erin's version', sans pockets, has a slight flare near the hemline. All seams are serged with the hem a simple straight stitch on the machine and inside waistband facings hand-stitched. A regular zipper in the center back because I still haven't learned how to install an invisible zip. Right now this is still okay to me. Love, love, love working with linen. This is a linen/rayon blend fabric purchased at Joann's and I used Carolyn of Diary of a Sewing Fanatic's method of prepping the fabric because I want (need!) all my clothes to be wash-n-wear... no drycleaning here! The only thing done differently was to serge all raw edges before the first wash..... and now I see here I only needed to wash and dry 3 separate times.... I washed and dried 4 separate times. Her post on linen educates us on why she 'enjoys sewing with linen', 'What is Linen', 'Pretreatment Methods' and 'Construction Methods'. As a newcomer to garment sewing I appreciate that so many advanced garment sewers freely share their knowledge base with us not-so-advanced. I do not own a copy of this fantastic book "BurdaStyle Sewing Handbook", but my local library does and even though I'd already traced the pattern, made copies of the book's instruction and made my own personal notes when I made this skirt before, I still wanted the book at hand as I made this one. I also wanted to continue checking out this book, and others like it, to support the garment sewing books my library is purchasing with the hopes that they will continue to do so in the future. What was kind of funny is that even though I'd made notes on my pattern pieces before when I made my previous skirt, I could not understand them (my own notes!) as I made this skirt! Coupled with the fact I've lost some weight, that meant starting from the complete beginning with this skirt.... making (new) modifications along the way. Oh, but this time I took the time to carefully write down on a separate piece of paper exactly what I was doing to each piece and step so hopefully, one day, I can just pick up this pattern and sew without having to think and fit so much. It was a beautiful sky this morning. The little rtw top I'm wearing is a different style than I usually choose, but I think I like it. Another 'gift' from Melissa from when she cleaned out her closet recently. It's a great skirt and I'm so happy that you found the information on linen helpful! Carolyn ~ THANK YOU so much for all you share. You are such a generous blogger with your experience and expertise.... and I'm so very appreciative. You are far too kind Mama Pea! Thank you so very much!